The North and South Korean militaries and the US-led United Nations Command on Tuesday held their first three-way meeting at the border village of Panmunjom to discuss measures about disarming the jointly patrolled area inside the heavily fortified border region. 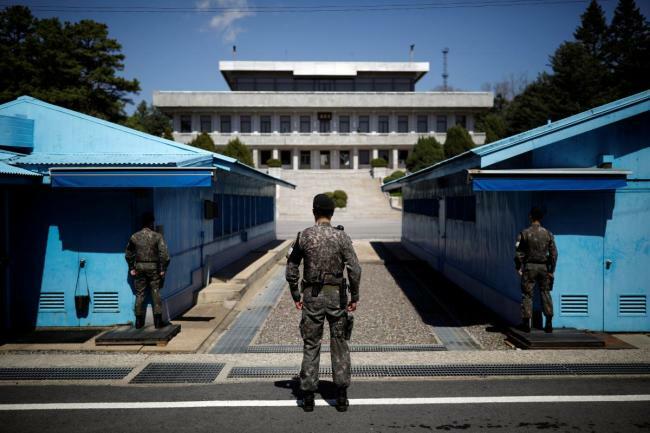 According to the Ministry of National Defense, the three militaries held a “consultation” on “working-level” issues related to demilitarizing the Joint Security Area, such as removing land mines, withdrawing firearms and guard posts and reducing the number of soldiers patrolling the area. Attended by three-member delegations led by colonel-level officers, the trilateral meeting follows the inter-Korean summit last month, when the two Koreas’ military chiefs agreed on a series of confidence-building measures to disarm the JSA and surrounding Demilitarized Zone. Military officials predicted that it would take a couple weeks to practically disarm the JSA until heavy firearms and guard posts are completely removed. The measure is to be implemented after the two Koreas complete removal of land mines near the JSA on Saturday. The ultimate goal of disarming the JSA, Seoul’s military officials said, is to return the area to pre-axe murder incident of 1976, when the two Koreas’ militaries were able to patrol freely without heavy weapons along the guard posts scattered inside the zone. Since two US officers were murdered by North Korean soldiers during a clash over cutting a tree inside the JSA, the two Koreas and UNC soldiers were restricted to their own patrol areas separated by the Military Demarcation Line inside the JSA. “Before the murder incident, the patrol soldiers were only allowed to carry pistols inside the JSA. Therefore, the future JSA will look like a pre-axe murder incident without pistols,” a senior defense official told reporters after the inter-Korean summit last month. But the outcome of the meeting appears to signal at challenges for future talks over the implementation of the two Koreas’ military pact, as the ministry’s statement released after the summit focuses more on mutual consultation than specific measures. The inter-Korean military agreement has raised concern in Washington that South Korea is moving too fast in engaging with the North despite a lack of progress in parallel talks aimed at denuclearizing Pyongyang. South Korea’s Foreign Minister Kang Kyung-wha has acknowledged that US Secretary of State Mike Pompeo expressed “discontent” with the military pact, which includes halting military drills, withdrawing guard posts and creating a no-fly zone in the DMZ. Gen. Robert Abrams, who is to replace Gen. Vincent Brooks as commander of the UNC, noted last month the efforts to demilitarize the border region is subject to UNC approval as the command supervises military-related issues inside the DMZ. “All activities with regards to the demilitarized zone are under the purview of UN Command. So while they may continue to dialogue, all of that would have to be brokered and adjudicated and observed and enforced by UN Command,” Abrams said during his Senate confirmation hearing.